The festival is held every year the first Sunday in November. It commemorates the 1619 landing of Capt. John Woodlief and 37 men, who sailed from England and made their home in Virginia, on what is now Berkeley Plantation. The men fell to their knees and gave thanks to God for safe passage, thereby beginning what is the American tradition of Thanksgiving. This year the festival is celebrating the 51st Anniversary of its incorporation as a charitable organization. First person re-enactors and musicians stroll the plantation grounds throughout the day interacting with guests. 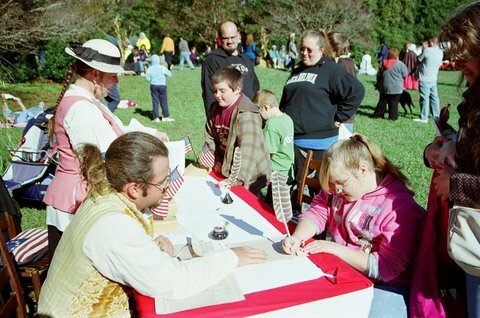 Parents and children can participate in Colonial period games and activities. Various vendors showcase their food, arts, crafts and jewelry. HomeMades by Suzanne, one of the Richmond area’s top caterers will once again be the official caterer for the festival. The formal program begins at 2:00 PM and includes re-enactment of the landing of Capt. Woodlief and his men. The Chickahominy Tribal Dancers culminate the formal program with a friendship dance in which everyone can participate. The public is invited to bring chairs and blankets for the event. Special seating arrangements can be made for motorcoach groups.